Blade Hunter is an action-packed side-scrolling MMOARPG. 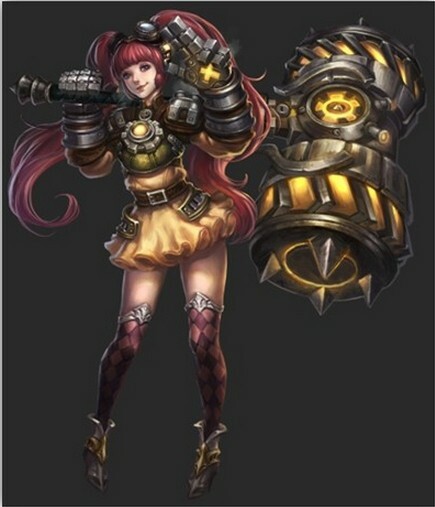 If you’ve played Dungeon Fighter Online, the nostalgia factor will be high. With its 2D graphics and intense combat, you will probably find yourself enjoying the game immediately. While not much new is offered, what is available is tried-and-tested gameplay mechanics that have proven to be quite enjoyable. With it’s own unique spin on the side-scrolling ARPG genre, Blade Hunter should be a blast to play. This one of the weak points of the game, unfortunately. However, I can understand it as Blade Hunter is based on the popular side-scrolling ARPGs that were developed in the early 2000’s, so it makes sense that they would go that route. 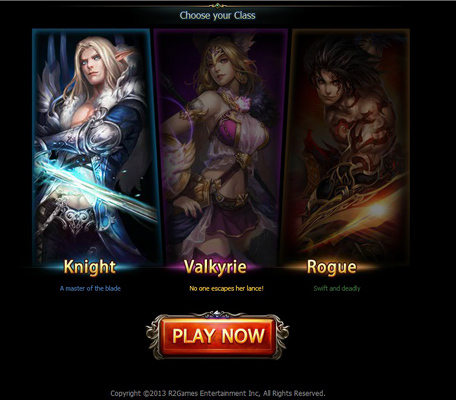 You are given three classes to choose from, and these are your typical caster, warrior, and rogue. You don’t have much control over your character past the gear you decide to wear, and the choices are limited even in this area. Perhaps later on in the games development more customization will be offered, but for now it’s severely lacking. I was actually surprised by how much I liked the 2D graphics in Blade Hunter. I didn’t think I would hate the graphics, but at the same time I expected I wouldn’t particularly like them either. However, once I was actually in the game and playing, I couldn’t help but marvel at the background artwork. The character artwork and animations aren’t half-bad, too. Can’t say I can complain about anything as, once again, the retro-style was a purposeful design decision by the developers. It’s a bonus that it turned out quite well, and you can tell some talented artists worked on this game. I don’t think this often, but Blade Hunter would be a great game to play with a controller. It’s unfortunate that I didn’t have one handy. WASD or arrow keys were used for movement, and keys such as H, J, and L were used to activate special moves. I have to admit that, at first, I found the controls confusing and hard to use. After a half an hour or so, though, I was able to play just fine. Overall, the controls were responsive and smooth, so I can’t complain. 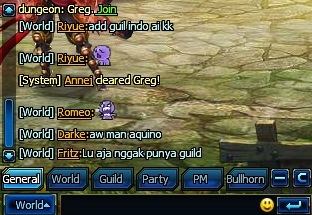 The game offers many different chat channels to communicate with other players, including guilds, parties, and PM’s. It seems like a lot of the players do not speak English as a native language, and it’s not uncommon to see other languages in the world chat (and there’s nothing wrong with that). There are a lot of English speakers, too. A lot of the players seem to be younger (in the 12-16 age range), but there are more than a few mature players though. I didn’t notice any trolling, and had a mostly pleasant experience with the games community. 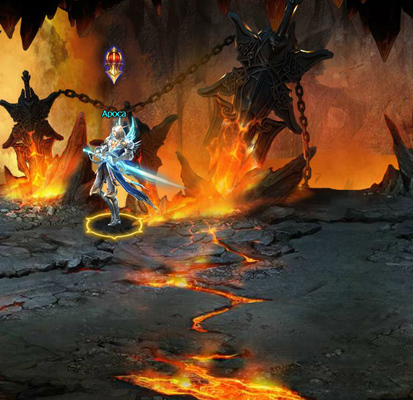 The gameplay in Blade Hunter is similar to other ARPG’s. There are a hub towns, from which you go out and complete zones and dungeons of varying difficulties. The goal of the game is to progress along the story, trying to complete areas with the best possible score while completing quests for rewards. Although the game is a “side-scroller”, you are actually given six directions (Forward, backwards, up, down, foreground, background) of movement, as opposed to the usual four (Forward, backward, up, and down) that we expect from a side-scroller. Combat in the game is pretty exciting. There are basic attacks, special abilities, and combos. Expect to see enemies (or yourself) flying around from being hit. Movement, specifically jumping, is important to combat when fighting certain types of opponents. Hit-count is very important in this game, to the point that your end score when you complete an area is affected by how high you got your hit combo. The questing and storylines in the game aren’t as in-depth as you would expect from a game in 2013. Quests consists of completing areas, so don’t expect any choices or puzzles. The story unfolds via cutscenes, which you’ll probably end up skipping after the first story-arc (I did, at least). I didn’t have much of a problem with this, as most of us wont be playing the game for the story (though it is a nice bonus). Don’t expect much more than a decent read if you want story from this game. The areas are pretty straight forward. You’ll go to the edge of the hub town, get a map that allows you to choose which zone you want to enter, and then you’re in. From there you will kill plenty of normal mobs, maybe one or two sub-bosses, and then you’ll face off against the main boss of the area. The bosses often have special abilities and a massive amount of HP. This will, for the most part, be the only challenging portion of the area. Once you kill the boss you are given a score, consisting of stars for different things such as your hit-combos, and an overall grade. After that you’ll get a chest to open for some loot, and then you’re popped back into the hub town. Blade Hunter is a pretty nice retro experience. I had previously never played games like this, but always regretted not giving Dungeon Fighter Online a try as it seemed like people were having a blast playing it. So getting a chance to play Blade Hunter was a treat and I had a blast with it. Some nice bonuses are the fact that the game is browser-based and the game is fairly low-spec and will be playable even on old machines. If you’re looking for a side-scrolling ARPG that is browser-based, this will more than likely be the game that you’re looking for.